In my house bacon is it's own food group. I live with three males and they can be sound asleep, but when I start frying bacon they suddenly appear out of thin air. The same goes for their enthusiasm for menu ideas. If I mention most recipes I get complete disregard or an occasional quick comment. However, if I casually mention that I'm making a recipe that involves bacon for dinner, suddenly they become very interested in everything I'm doing. Occasionally my oldest goes so far as to run around the house with a crazy voice shouting the word bacon over and over again. It's a little odd, but the boy knows what he likes and bacon is at the top of the list. There is something very appealing about a delicious and juicy burger. My whole family loves them and I make some burger variation at least once or twice a month. 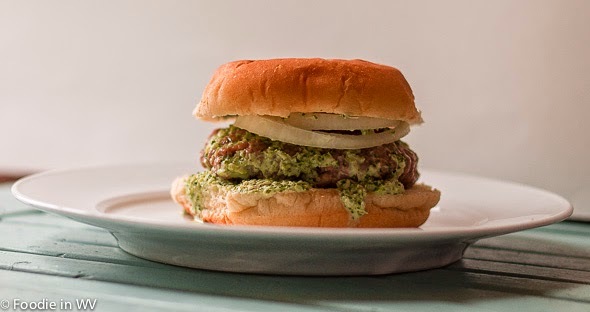 Last week I made a new recipe for Bacon Burgers with Cilantro Yogurt Sauce. The recipe is as follows. Adapted from the July 2014 issue of the Food and Wine Magazine. A tender burger recipe using ground beef and minced bacon and served with a delicious yogurt sauce. Puree the yogurt, jalapeños, cilantro, ginger, onion, sugar and 1 teaspoon of the salt in a food processor. In a separate bowl combine the ground beef, scallions, mint, Parmesan, lemon zest, lemon juice, pepper, cayenne, and remaining salt. Form into 8 burger patties. Either using a grill or a griddle, cook the burgers for 6-8 minutes or until 180 degrees. Serve the burgers on hamburger buns topped with tomatoes, onions, lettuce, ketchup, and/or Sriracha and the yogurt sauce spread on the bottom of the bun. *Note: In order for the bacon to be fully minced either use a food processor or cook the bacon until crisp, crumble, and then add to the recipe. Alternatively you can used real bacon bits. Be very careful that you fully mince the bacon. If the bites are too large the burgers will end up with large grease pockets. When properly minced the bacon keeps the burgers moist and is a great addition to the ground beef. I love to serve burger with yogurt sauce too...next time I am going to add cilantro in it. Your burger looks very juicy and delicious, Ann. I'm a big fan of yogurt sauces, they are delicious! Thanks for the sweet comments, I'm working on catching up on everything blog related! I'm with all males, too, and it's the same with my guys and bacon. They would all live off of it if they could. The sauce is the best part, it would also work with other types of protein if you don't eat beef (since I know you don't eat meat it would probably also work with quinoa burgers or be great with black bean burgers). Oh yum. I love bacon. I know exactly what you mean. Last night, I was taking some out of the package for my husband to cook on the grill for the Cobb salads I was making for dinner. I was kind of ashamed of myself but I couldn't help thinking that even raw bacon smells delicious! I have a couple of bacon freak boys at my house too. They can eat bacon by the pound. This burger looks really good. I like the cilantro yogurt sauce. Mine pretty much eat bacon by the pound two. We buy the huge double packs at sam's since they can never just eat one or two pieces!! Aha, Bacon lovers at your house too! This burger looks fantastic and I love the sauce you created - I bet it compliments the burger just right! Great combo, that tasty burger and a refreshing sauce! The burger and the sauce really do work well together. Plus it keeps the burger nice and juicy! I will always approve of a bacon burger! I just posted about one myself recently! i love a good burger. we rarely eat bacon, but treat ourselves once in a while, lol! I think it's a male thing too :) I do take all the photos, some of them turn out better than others. I normally only have a few minutes to take them before dinner, so depending on the light, plating etc. they can either turn out okay or horrible :) Thanks for the sweet comments though, I really do appreciate them!